CLARE Park offers short and long term horse agistment. We can cater for colts and young horses, as well as broodmares, but specialize mainly in racehorse spelling. Agistment starts at $15/day (GST exclusive) and individual or shared paddocks are available depending on each horse’s requirement. Paddocks are all improved pastures, with Rye and barley sown down in the winter months to provide good feed through winter and into spring. This makes us an ideal winter agistment option for horses from Victoria or colder areas where some horses might not do as well (older mares or horses just recovering from illness or injury etc). 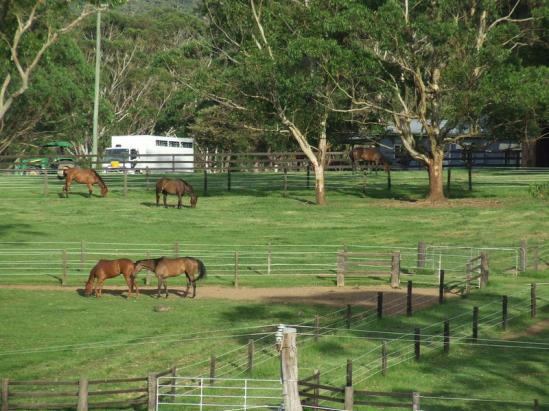 Our paddocks all offer good shade and shelter from bad weather. Feel free to contact us at any time to discuss spelling and agistment options.